It's hard to believe that Thanksgiving is almost upon us. What is it, ten days away? Then gasp Christmas a month later?? Where has the year gone? Wasn't just yesterday Halloween?? Don't tell anyone but nary a gift has been purchased in this household for the big day, let alone the four birthdays between now and then. As far as Thanksgiving goes I can wait a few more days to buy the turkey right? As long as I have sufficient time to thaw that behemoth of a bird, it's all good! Meanwhile, I'll let you in on a little secret of mine... Having never been a candied sweet potato casserole type gal, recently I've discovered the goodness of the freshly baked incarnation. I like the lightly sweet caramel-ly flavor that is naturally there. A bit of butter and I'm in heaven! In the vegetable world, there can be a bit of confusion in terms regarding Yams vs. Sweet Potatoes and I will leave that to the experts. For my purpose here, and for today's recipe Garnet Yams are used which are actually a sweet potato. These tubers vary in size and have a dark reddish colored skin and taper at each end. The flesh is a rich orange color and is perfect for fall cooking. 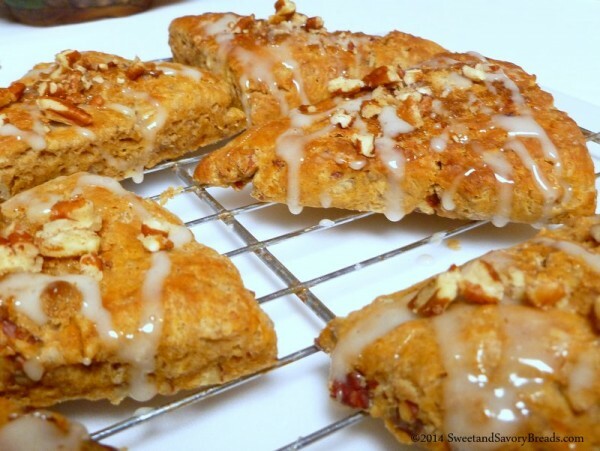 Without further ado, I present to you Sweet Potato Pecan Scones. 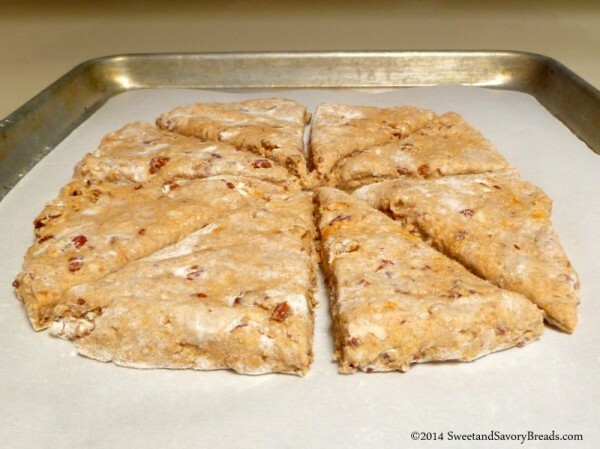 These delectable triangles are a cross between a traditional scone and a slice of sweet 'tater pie. Enjoy! 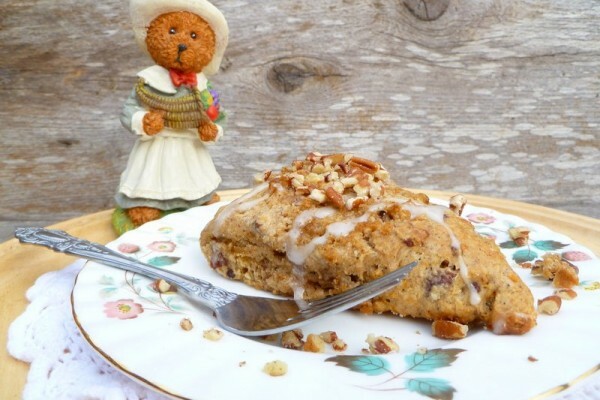 Sweet Potato Pecan Scones filled with crunchy toasted nuts and drizzled with a light maple glaze give you all the flavors of your favorite pie. Line a baking sheet with parchment paper and set aside. Place flour, sugar, salt, baking powder, cinnamon and nutmeg in a mixing bowl and stir until well combined. Cut the (very cold) butter into small pieces and add to the bowl. 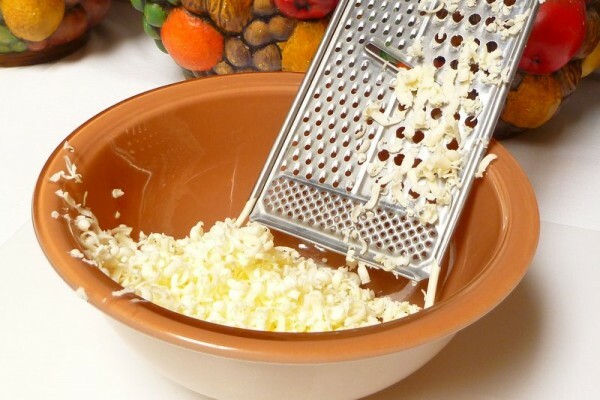 Alternatively, freeze the butter and grate into the bowl. Using clean fingertips, quickly rub the butter into the flour mixture until it is the size of peas. You may also use a pastry cutter for this. Add the mashed sweet potato and half and half and toss with a fork. 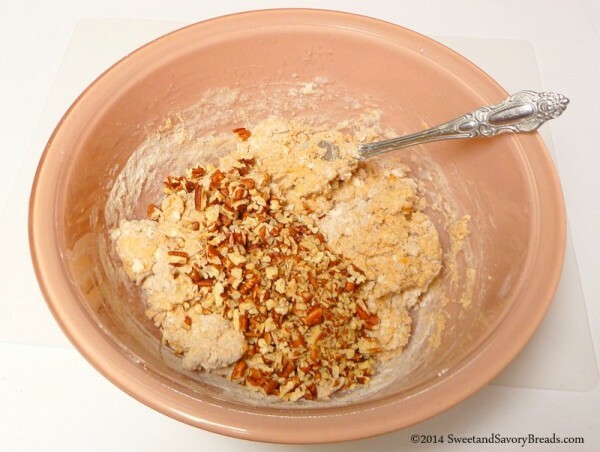 Reserve nine pinches of toasted chopped pecans for topping then add the rest to the bowl. 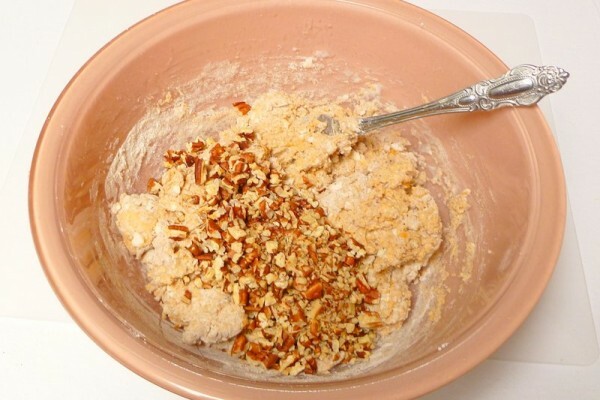 (See notes section below for how to toast pecans) Continue to lightly mix just until the dough comes together. Do not over-mix. 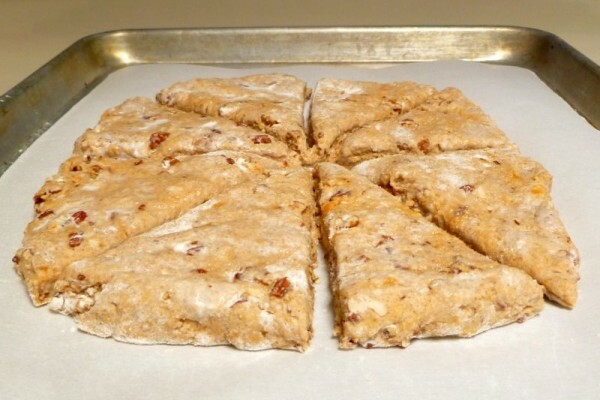 Turn the dough out on to a floured surface, knead two or three times then pat with floured hands into an 8" x 6" rectangle approximately 1/2 to 3/4 inch thick and cut into triangles. Place the scones on the baking sheet fairly close together and brush with more half and half or melted butter if desired. Sprinkle with brown sugar. 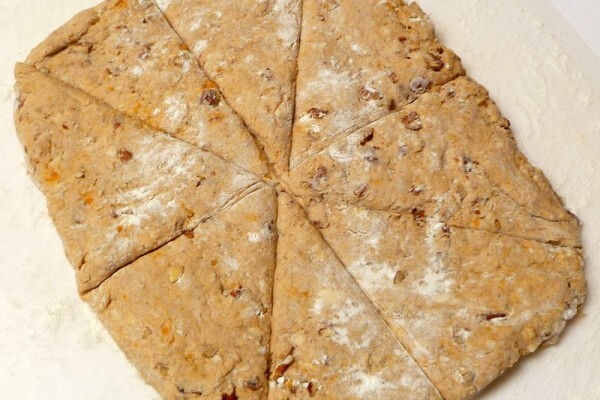 Chill the shaped dough in the refrigerator for 10-15 minutes. Meanwhile preheat the oven to 375 degrees F.
Bake the scones for 15-20 minutes until the edges are golden brown. Remove to a wire rack to cool. 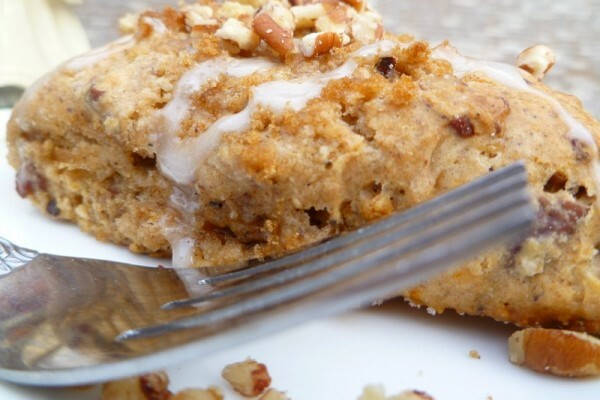 Whisk the glaze ingredients together in a small bowl and drizzle over the warm scones. Garnish with reserved pecans. For the best results keep the butter and half and half very cold until the time they are used. Butter can be measured out and frozen then grated into the flour mixture. 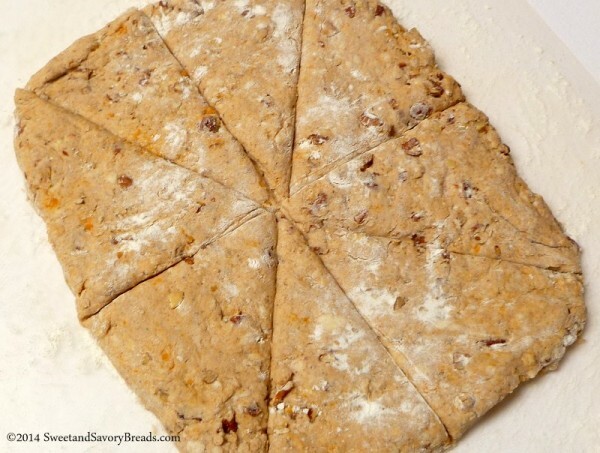 Incorporate the butter into the flour mixture quickly and don't overwork the dough. There should be pieces of butter visible when patted out. Scones may also be cut with a round cookie cutter taking care not to twist but cut straight down and up. Fresh cooked, cooled and mashed sweet potatoes may be used or for convenience use canned, draining off syrup before mashing. 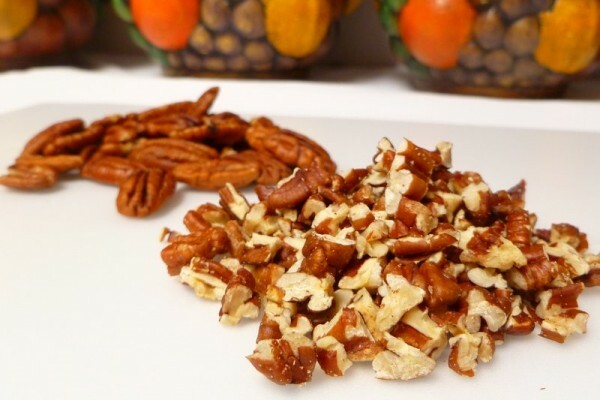 To toast pecans, spray a baking sheet with non-stick spray and bake in a 350 degree F oven for 5-6 minutes stirring occasionally until fragrant. 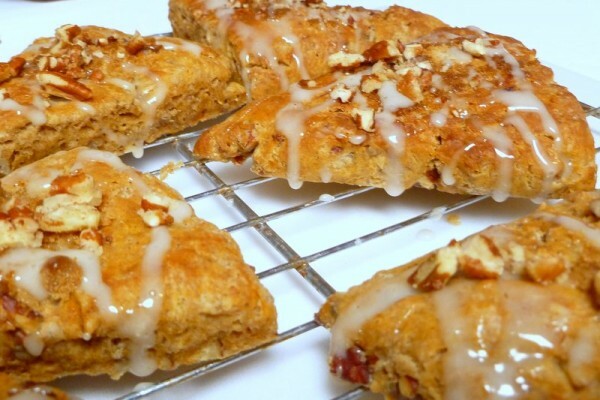 Scones may be kept for two or three days if tightly covered but are best consumed fresh. Have you tried this recipe? Have you made something similar? Do you like a particular photo? Does a step seem unclear? Comment below, we'd love to hear from you! Sign up for 8 free recipes each month! Subscribe to our once-a-month recipes newsletter, and we will send you 4 sweet and 4 savory bread recipes in each email. We promise that spam is never an ingredient! Go ahead a subscribe below! 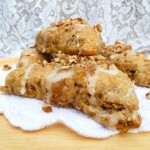 Posted in Breakfast BreadsTagged breakfast, butter, featured, maple, pecans, scones, sweet, sweet potatoBookmark the permalink. 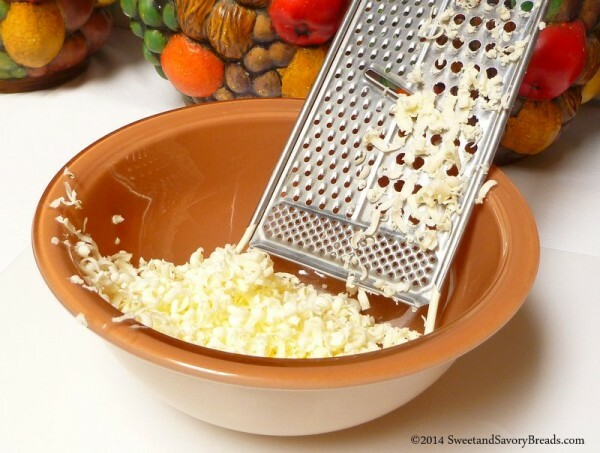 Nice tip about freezing and grating the butter. Never seen that before. Will have to give it a try!